"Jones starts his trek every morning at 7 o'clock, rounding out his journey shortly four hours later, and it’s off to the next city. He said the people he meets at the starting line are what keep him going strong. "It's the greatest compliment I could receive, to have somebody come down and want to run with me, and you know, be willing to endure some pain with me on behalf of veterans," said Jones." 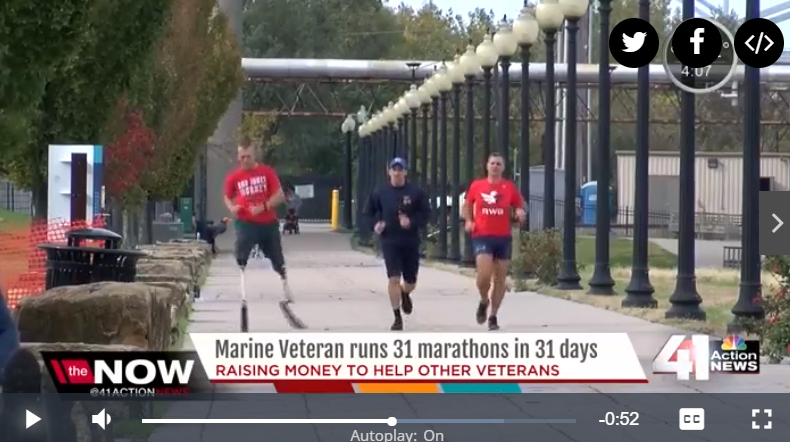 "USMC veteran Rob Jones, 32, is running 26.2 miles in Kansas City on Monday, October 23rd - his 12th city toward his goal of completing 31 marathons, in 31 cities in 31 days. Jones is a double leg amputee - he lost both his legs, above the knees, to an improvised explosive device in Afghanistan in 2010. He was serving as a combat engineer."